Definition at line 12 of file CREReportDialog.h. Definition at line 7 of file CREReportDialog.cpp. References accept(), currentRowChanged(), CRESettings::loadReports(), myDisplay, myFooter, myHeader, myList, myName, myReports, mySort, onAdd(), onDelete(), onHelp(), refreshList(), reject(), and settings. Definition at line 64 of file CREReportDialog.cpp. References myReports, saveCurrentReport(), CRESettings::saveReports(), and settings. Definition at line 135 of file CREReportDialog.cpp. 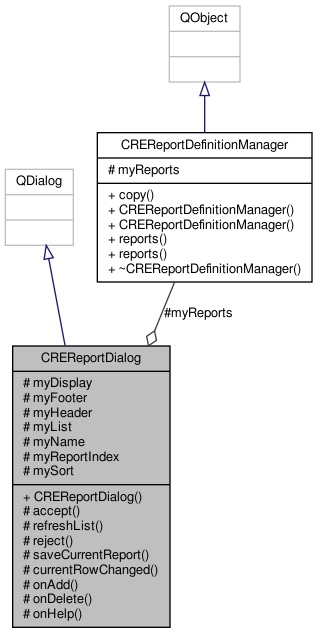 References CREReportDefinition::footer(), CREReportDefinition::header(), CREReportDefinition::itemDisplay(), CREReportDefinition::itemSort(), myDisplay, myFooter, myHeader, myName, myReportIndex, myReports, mySort, CREReportDefinition::name(), CREReportDefinitionManager::reports(), and saveCurrentReport(). Definition at line 85 of file CREReportDialog.cpp. References myList, myReports, refreshList(), CREReportDefinitionManager::reports(), saveCurrentReport(), and CREReportDefinition::setName(). Definition at line 95 of file CREReportDialog.cpp. 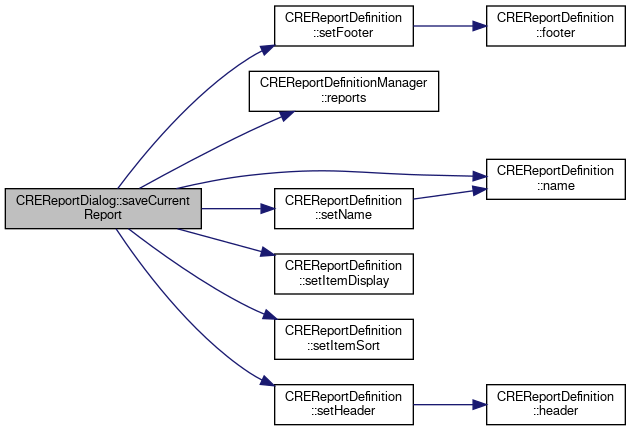 References myReportIndex, myReports, CREReportDefinition::name(), refreshList(), and CREReportDefinitionManager::reports(). Definition at line 80 of file CREReportDialog.cpp. Definition at line 110 of file CREReportDialog.cpp. 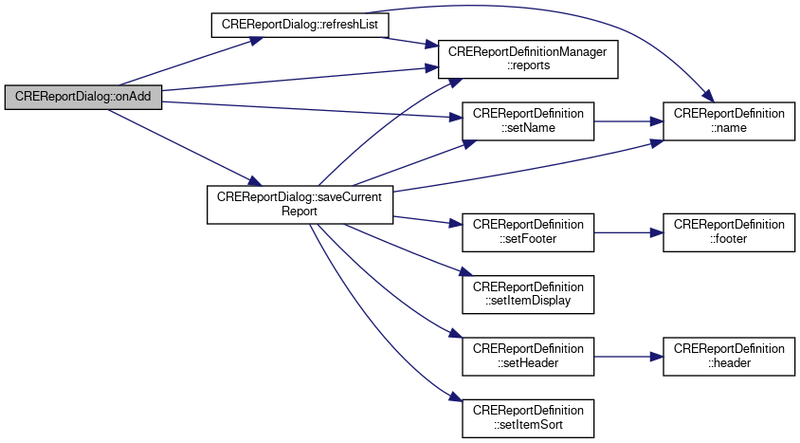 References myList, myReportIndex, myReports, CREReportDefinition::name(), and CREReportDefinitionManager::reports(). Referenced by CREReportDialog(), onAdd(), and onDelete(). Definition at line 72 of file CREReportDialog.cpp. Definition at line 121 of file CREReportDialog.cpp. References myDisplay, myFooter, myHeader, myList, myName, myReportIndex, myReports, mySort, CREReportDefinition::name(), CREReportDefinitionManager::reports(), CREReportDefinition::setFooter(), CREReportDefinition::setHeader(), CREReportDefinition::setItemDisplay(), CREReportDefinition::setItemSort(), and CREReportDefinition::setName(). Definition at line 24 of file CREReportDialog.h. Referenced by CREReportDialog(), currentRowChanged(), and saveCurrentReport(). Definition at line 25 of file CREReportDialog.h. Definition at line 22 of file CREReportDialog.h. Definition at line 20 of file CREReportDialog.h. Referenced by CREReportDialog(), onAdd(), refreshList(), and saveCurrentReport(). Definition at line 21 of file CREReportDialog.h. Definition at line 27 of file CREReportDialog.h. Referenced by currentRowChanged(), onDelete(), refreshList(), and saveCurrentReport(). Definition at line 26 of file CREReportDialog.h. Referenced by accept(), CREReportDialog(), currentRowChanged(), onAdd(), onDelete(), refreshList(), and saveCurrentReport(). Definition at line 23 of file CREReportDialog.h.